“It will be so much nicer after Daylight Savings and we’re only 6 hours off the east coast,” Chris said to no one in particular while sitting in the Peace Corps office resource room recently. 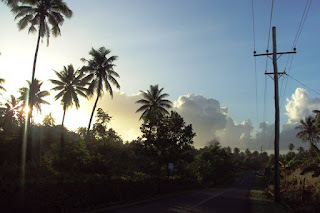 Since our group arrived nearly 2 years ago, Samoa has wavered between being 6 and 7 hours off Eastern Time, depending on whether the east coast is in Daylight or Standard time, and thus 3 or 4 hours off my old haunts in California on Pacific time. But this year, there’s a twist. Chris was none too excited to hear this, which wasn’t surprising. I certainly have less people with whom I communicate regularly living on the east coast, but I can imagine how a 6-hour time difference could far more convenient than a 7-hour one; goodness knows I have enough trouble with 3 hours and 4 hours. But then I thought of something. “I wonder if we’re springing forward or falling backward.” Samoa’s in the southern hemisphere so seasons are backwards from those in America. School lets out of the summer in late November/early December, Christmas is spent at the beach, and September 21 (or 22) will be our spring equinox. One quick Google search confirmed my suspicions: we are indeed springing forward. On Sunday, September 26, Samoa will move its clocks forward an hour. This has bizarre implications when one considers America, what with its northern-hemisphere-status, will move its clocks backwards on Sunday, October 31. 1 hour ahead of Hawai’i. This year it will be weirder. But, if nothing else, Chris will be happy.